The news breaking today is that a Seattle NGO, Basel Action Network, is releasing a documentary with PBS about their "watchdog" effort to sabotage LCDs (making them non-repairable) and then track them overseas with GPS transponders. The first company they have "outed" is Total Reclaim, an E-Steward certified company in their own home of Seattle Washington. Does this sound familiar? You take electronics which someone wants to reuse, cut wires, and turn it in for reuse and repair. Someone buys it for repair, and then you accuse them of having shipped it for "primitive" recycling. BBC Reporter RAPHAEL ROWE cut a wire (thinking export for repair is illegal - should have read Basel Convention Annex IX, B1110 on export for repair of CRT monitors and TVs). Context: The Seattle Recycler received about 28.5M lbs of TVs, printers, computers, cell phones - as well as car seats, x-ray machines, and UPS. The NGO doesn't say that the mass balance is off. Of the 28.5M lbs, about 28M lbs of garbage-in came back out as baled steel, plastic, non-ferrous metal, and CRT cullet. What the NGO's methodology is to find a device NOT in demand in the USA (CRTs in 2012 Benson case, smaller flat LCDs this year) but in high demand with overseas repair. They take one that looks nice, open it and sabotage a wire, then place a tracking device. When the Recycler has a staff person do sort-for-repair, the GPS is tracked, and the NGO implies that 28 million pounds are in question. Had the NGO put its GPS tracking device in a random printer or CRT television or Pentium 2 computer, no one has ANYdoubt that Total Reclaim would have long recycled it. This test is designed to disguise the GPS device in the biggest cherry, the patients who we believe could be saved from the recycling creamatorium. Then, the NGO uses racist language to describe the "primitive" repair people who make a living by cherry picking luxury clients "waste" for the "good enough" market. If BAN had put the tracker in a Pentium 2, a printer, a CRT television, virtually anything (aka random sample), they know perfectly well the Recycler would have scrapped it. They chose the device they did because it has high demand and repair markets overseas, and they tracked it to a place a few miles from where the device was probably originally made... a place with more expertise in the device than anywhere in the world. Remember, the reason NGO BAN told everyone to be very concerned about the export for repair market is that they told the press 80% was not repaired, but was dumped, in "Digital Dump" or "reuse excuse" language. But it turned out they were making that up. And their website still has the same garbage. 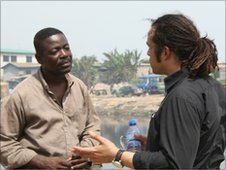 Been there, Done that: Five years ago, BBC sabotaged a piece of equipment that any African TV repairman would want, and placed a GPS tracker in it. They didn't say if they also put trackers in CRAPPY looking e-waste, like we mostly see, and that no one in the export business wants. They put it in something which repairpeople know is 95% of the time working or repairable. Greenpeace activists and Raphael Rowe "cut a wire" in a working television, inserted a GPS transponder, and delivered it to a licensed collector, who sold it to Joe Benson's licensed reuse company, who sold it to Ghana's Tech Sector. 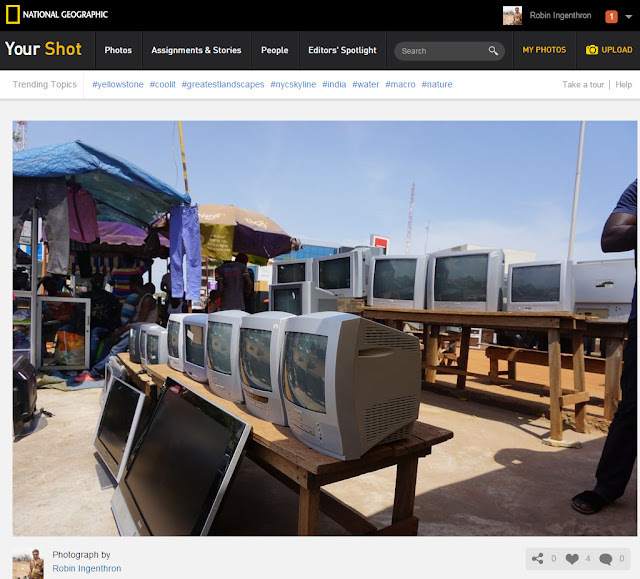 In Ghana, BBC had to buy the TV back for 40 Pounds Sterling (about $60 USD) because the African who had it wanted to keep it and repair it. Sixty dollars - that is about THIRTY TIMES the value of the copper in the TV. But then, Raphael Row interviewed Mike "fishing as a boy" Anane, the "expert" who told him that 80% of these units would never be repaired, and would be dumped. I asked Anane (met him personally at an Interpol Meeting) where on earth he got the "80% waste" statistic, because it was a) economically impossible and b) demonstrably false. Anane told ME then that his source was Basel Action Network. 80% was indeed BAN's "statistic". And in his trial documents (which I have copies of) Joe Benson's prosecutor claimed it was "common knowledge" that the "vast majority" of displays sent to Africa were never going to work. Puckett still repeatedly states that Africans scrap them for copper "even if they work perfectly". But the statistics keep coming in from ACTUAL RESEARCH. Actual containers are studied, actual baseline data from World Bank and IMF on households with TV, and the Basel Convention Secretariat itself now estimates 85% of imports to Africa do not even require repair, and after repair that 93% are reused. People are screening these. Damage happens in handling, inspections are sometimes flawed, sorting and testing labor may miss a piece. But even brand new product sold in the USA has a high return rate. Most of the waste stays in Seattle, Stays in UK, stays in the OECD! The point is MASS BALANCE. Total Reclaim can show that it is processing domestically 95% or more of the product they receive. THE CRT GLASS TEST, which BAN embraced in 2004, is a mass balance formula. TVs come in to Total Reclaim, and massive quantities of glass, plastic, mercury lamps, circuit boards, etc. come OUT of Total Reclaim. MASS BALANCE is what PBS should be asking about, and MIT Senseable City lab should know better as well. If there is a process to divert 5% for reuse, and an NGO has sabotaged a unit to make it look like it can be reused, and it goes out with the 5%, that doesn't prove malfeasance. This story stinks. The methodology stinks. It's a test anyone could fail, despite having perfectly good systems in place and more importantly a mass balance that PROVES 90% of the material is scrapped. And the conflict of interest stinks, too. 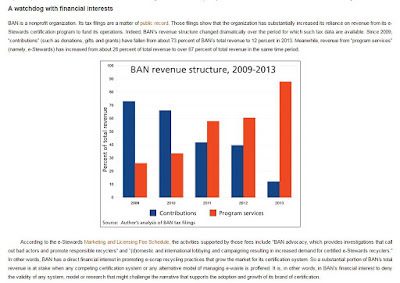 BAN is telling people that their PAID CERTIFICATION program is necessary. They told us it was necessary because, they said, 80% of the e-waste is not being domestically recycled, but is being dumped overseas. 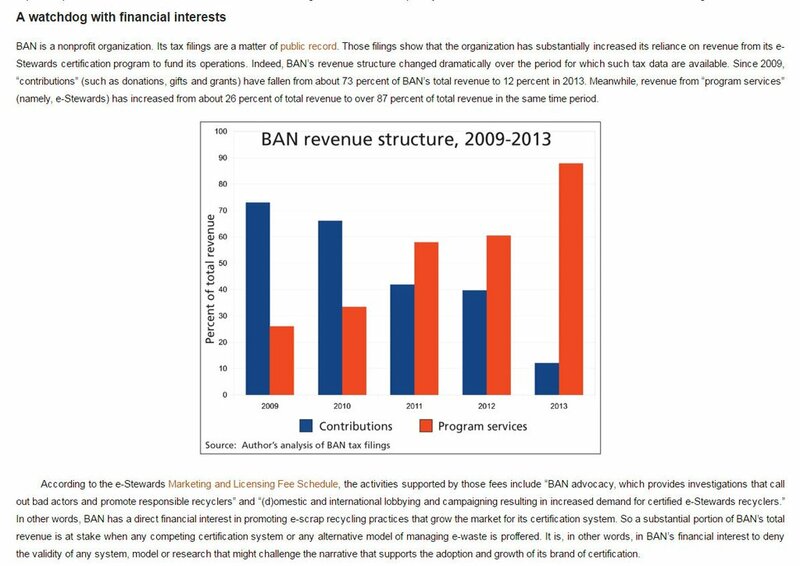 But really, it's necessary for BAN to make money, because donations are falling. When the statistics which their Paid E-Steward Certification is based on turns out to be completely wrong what do they do? They go back to the #hurricanejoebenson trickery. Make something look like a display that will be repaired and improve someone's life overseas, and then make claims that the people who sold it there are actually shipping illegal waste. Hopefully PBS does a little bit better job than BBC has done (below, BBC shows "expert" Michael Anane touching aluminum phosphor and saying it is LEAD (Pb) dust). But it already looks like they are failing to report on actual methodology of mass balance and are again going on a witch hunt designed to make more money for an extortionist NGO which makes smug, bigoted comments about "primitive" Hong Kong and "orphans and children" behind the import of used electronics to Africa. 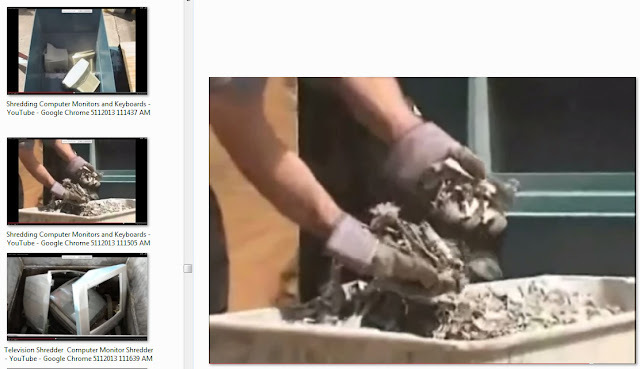 Basel Action Network takes photos of kids at dumps, raises millions, and does not share one nickel with the people in the photos... and keeps showing the photo of the "child" for decades. Their business is to impugn and denigrate those of us willing to help and do business in their countries. (Hong Kong is richer per capita than the USA! But BAN calls it "primitive"!). We wrote all about this NGO and it's "methods" for impugning the Tech Sector in emerging markets, its acceptance of big checks from shredding companies and planned obsolescence original equipment manufacturers, their campaign to exaggerate and show fear. Look up the 2103 Series in the blog on BULLYBOYS. Joe Benson has company. It's all of us in the recycling business. BAN is going after E-Steward companies like Total Reclaim, R2 certified companies, and companies that do none of the above, not reporting on the data that they have in hand proving the unlikelihood that Total Reclaim and others sent any significant quanties of the e-waste overseas. Please, Gwyn Ifill and PBS... please interview some professors and researchers who are NOT making money off of false data.